From Beverly Hills to Santa Monica, Los Angeles-based designers were busy gathering around tables, whether it was a swanky dinner party or a DWR tutorial. When we rounded up our designer events for the month, we noticed that Los Angeles is where we want to be! Designers Katherine Carter, Orlando Soria, and Kerry Vasquez spearheaded two events centered around dining tables. 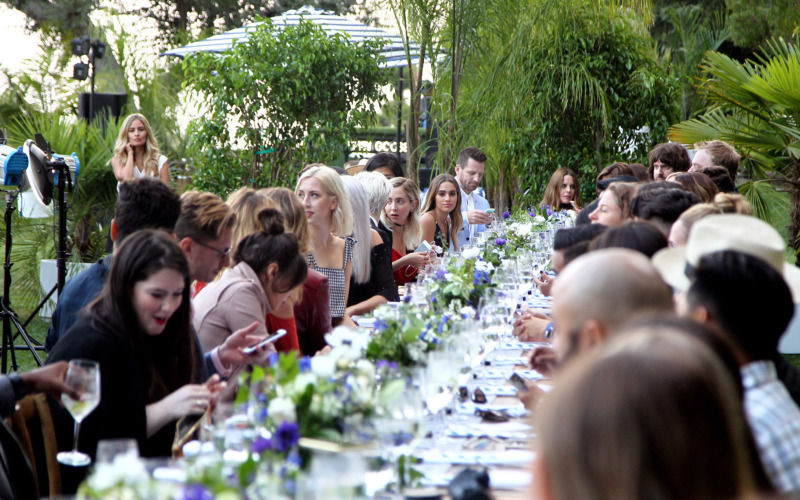 Katherine took on a modern tablescape tutorial at DWR Santa Monica, and Orlando and Kerry participated in the Grey Goose vodka Boulangerie Bleue dining experience in Beverly Hills. Read below for more about each event. Homepolish designer Katherine Carter has completed some stunning projects in her years with Homepolish. From a total redesign of a LA Tudor Revival to a commercial projects such as the Gem Tech Offices in Venice Beach, she’s shown that she has a knack with working with a variety of styles and project scopes. But when an opportunity came up at Design Within Reach Santa Monica, we couldn’t help but volunteer her for a project with a much smaller scope. Katherine led a tutorial open to the public on how to set a modern dining table. Though it might not be an entire bathroom or redesign of a 100 year-old home, the table is an essential part of the home from an aesthetic and functional standpoint. To see more of Katherine’s tips on the matter, check out her full table setting guide.